Cor Leonis is a Character in Final Fantasy XV. A valiant protector who stood beside Regis during the king’s journey thirty years prior, and continued to serve his liege marshalling the Lucian Crownsguard. Cor the Immortal’s heroic feats in battle make him the stuff of legend, and for Noct and his closest friends, an invaluable ally in the field. 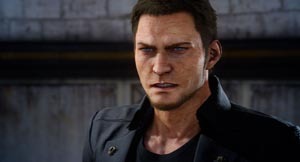 Cor is the character who puts Noctis on the path to collect all of the Royal Arms from the tombs of past kings, otherwise known as Royal Tombs. Cor joins the party during the Quest, Declaration of War. He makes use of the Lion's Roar Technique. Gives you Sword of the Wise. also : he killed king regis, also : i think he prefers the name "glauca" ?